Lectures... interviews... song-writing sessions -- catch them clearly with the latest generation of easy-to-use digital voice recorders from Sony. Smartly styled and easy to use, they're ideal companions for anyone who needs to capture the moment with digital clarity when inspiration strikes. This year's digital recorder line-up emphasizes sheer sound quality, plus simple operation and practical features for recording, storing and sharing your voice and music files. Intelligibility is enhanced by a new S-Microphone Recording System. Developed by Sony, it couples advanced audio processing technology with a highly sensitive new microphone that captures even faint or distant subjects with extra clarity while reducing background hiss. ICD-SX digital voice recorders feature a 'two position' stereo microphone that can be adjusted instantly to suit the subject being recorded. For dictation or interviews, both unidirectional microphones can be angled straight ahead to face the speaker directly. For meetings or music recordings, mic positions can be swivelled 120 degrees apart to cover everyone in the room. Newly-designed acoustic isolation also cuts the transmission of mechanical and handling noise to both microphones from the main recorder. A newly-developed Intelligent Noise Cut function reduces intrusive background sounds while boosting the clarity of human voices. Unlike ordinary digital voice recorders that simply cut high and low frequencies, Intelligent Noise Cut analyses the 'fingerprint' of background noise, removing unwanted frequencies to leave recorded speech sounding crisp and natural. All PC-Link models now feature a handy card slot that accepts a choice of MicroSD or M2 memory cards to boost on-board storage space. After recording, just slip the removable media into your PC's card reader to transfer files for storage or editing. A new Scene Select function takes the uncertainty out of adjusting recorder settings to suit your subject. Just pick 'Music', 'Meeting', 'Interview' or 'Dictation'. Record mode, record level, low cut filter and limiter settings are set automatically for clear, natural sounding results. There's a new Track Mark function that makes it easy to navigate your way through the longest recordings. During recording or playback, just touch the comfortably-placed 'T-Mark' button to add up to 98 marker points per file. All PC-Link models come supplied with new Sound Organiser software for easy cataloguing, editing and sharing of voice and music files on your PC. All new digital voice recorders by Sony are compatible with Dragon Naturally Speaking 11 (Recorder edition), the acclaimed voice recognition/transcription software package. New ICD-UX models achieve a 5-star certification for dictation accuracy, while ICD-AX and ICD-PX models gain 4-star status. As well as achieving unprecedented 6-star certification for dictation accuracy, the range-topping ICD-SX712D comes bundled with a copy of Dragon NaturallySpeaking 11 (Recorder Edition). This year's digital voice recorder line-up from Sony covers all your audio note-taking needs, from speech to music. The student-friendly ICD-BX and ICD-PX Series offer high-quality MP3 stereo recording and playback, plus a generous 2GB on-board memory and handy features like voice operated recording. The ICD-AX series adds large, friendly buttons for fumble-free operation, plus an FM tuner for enjoying your favourite radio broadcasts. The new ICD-UX Series places a premium on sound quality and convenience, with MP3/WMA/AAC playback and a built-in USB connector for easy 'cable-free' connection to your PC. Ideal for interviews and live music recordings, the no-compromise ICD-SX Series offers a huge 2GB of storage space -- plenty to record the longest series of lectures. Linear PCM recording ensures pristine sound quality via the stereo pair of high-quality angle-adjustable microphones, making the ICD-SX Series an ideal 'sketchpad' for songwriters and rehearsing musicians. 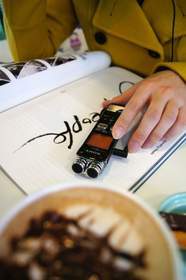 The new range of digital voice recorders by Sony is available from April 2011. Sony is engaged in a constant review of its manufacturing, operational and business practices to ensure that its products are developed in an environmentally responsible way. Please refer to www.sony.eu/eco for background on environmental activities of Sony.